Are We Havin' Fun Yet ? It Takes All Kinds ... of skilled people to keep this ball rolling in such a smooth fashion , under sometimes very difficult situations , performing highly complicated tasks in environments that can range from sterile to toxic . Enjoying what you do , no matter what you do , really takes a special kind of skill level , that of a true professional . Above we see Mike Adamson and Dawn Hannah getting ready to start ripping this thing apart ! Err , I mean getting ready to disassemble the steam inlet end of the Unit 1 Steam Turbine . This particular contract has been awarded to Siemens-Canada , and involves some pretty heavy-duty disassembly work and more importantly , many extremely intricate re-assembly procedures . Above is a photo Zsa-Zsa Gabor snapped while hang gliding through this huge power plant . 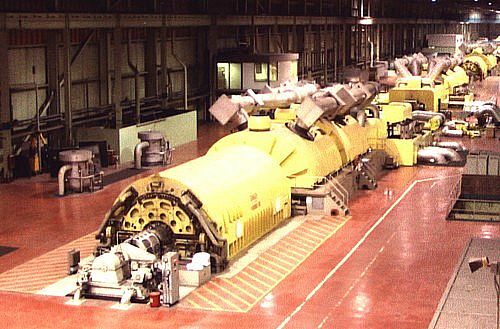 A kilometer long , it pumps out 4 gigawatts of juice via eight 500,000 watt steam driven generators . To some viewers it may very well seem like a nice picture of some pretty yellow machines . Hydro employees understand that the total process to creating this much electricity is both elaborate and complex . The simplest solution to the end result is breaking it down into 'pieces of the puzzle' ... each team member of each department learning their contribution as fully as they are able . So You Wann'a Be a Millwright ? Yep , this is one of those places we talked about earlier . Maybe not the most comfortable place to be , but this is where the action is . Dust mask is not an option , but is an essential piece of equipment as is the large hammer wrench in the hand of Attila Tiffan . Judging by the smile , I'd say Attila is destined to be a Pro ... once he finishes his apprenticeship that is (grin) . Yep , We're Havin' Fun Now ! Above we see Attila's partner , Emile Bisson also obviously right at home inside these "pretty yellow machines" . 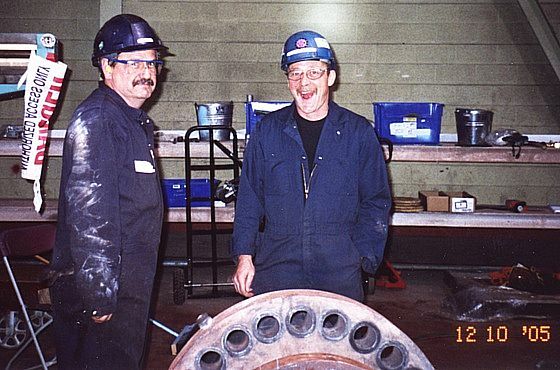 The job of these two capable Millwrights is to 'change-out' these many large high-tensile studs (bolts) that are designed to contain the incredible energies created inside giant steam turbine engines ! Not a simple or easy job by any means . The studs are heavy and it takes teamwork to coordinate the handling process . Good example of hard , heavy work that also must be done within very high tolerances and with SAFETY at the top of the priority list . It's a challenging assignment that requires both brains and brawn . 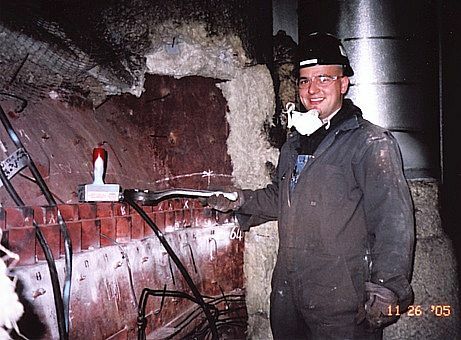 This is just another typical example of the kinds of tasks Construction Millwrights are world famous for . Famous saying "Millwrights , We Can Handle it !" and this particular task is one of those that eventually separates the "men from the boys" so to speak . These studs have been superheated for years and years , essentially welded together now and must be removed on schedule , hence the almost impossible aspect of the job . No small coincidence that this particular task has been assigned to a certain group of most capable individuals who almost seem to revel in the challenge of it all (The Construction Millwrights , of course) . Overhead work is the most difficult , especially in such confined quarters where extremely high temperatures and incredible humidities can only be slightly offset with large air movers . Supervisors like Jim Kovacs must carefully study their crews and then assign 'the best of the best' to these most difficult jobs . Spend a few painful minutes observing the difficulty level of this particular task and one will quickly understand that Steve Ryder has purposely been assigned as a key player . Steve is pure power and right at home in these very familiar , extremely demanding environments . Just standing here taking photographs was enough for me , never mind wrestling a 60 pound airgun overhead while wearing all the essential protective safety gear . Take's a special kind of person to do this kind of extreme work , and thankfully , Millwrights like Steve Ryder are absolute naturals at it . Effectively swinging a 15 pound sledge , Steve removed 'frozen' stud after stud that many had said could never be removed without expensive machining , first . Doug Radtke is the team Hoisting Engineer , and it's by no accident that he is here . 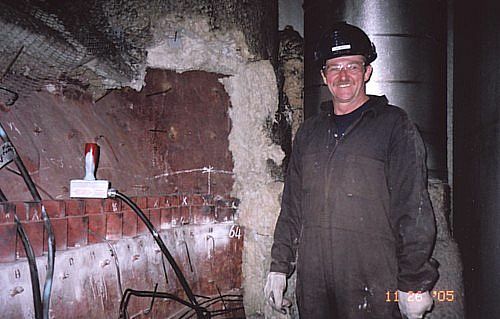 He's a very well known "Hoister" in this area , and totally familiar with all aspects of the industry , from turbine tear-out to rebuild or re-assembly . It takes a very fine 'touch' to be able to place 100,000 pound loads exactly . 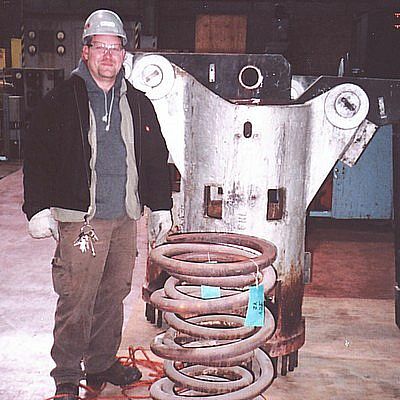 Millwrights require a feather-touch placement on certain 'lifts' and Hoisting Engineers like Doug Radtke are a key ingredient to accomplishing the vast scope that the Millwright Power Rigging Agreement provides for , without accident or incident , 100% of the time . Here we see Danny Lebourque framed between suspended parts of the now disassembled 'X - Side' RESV Valve body . These rarely visited areas of the Turbine's underbelly are not for the faint of heart and are completely off-limits to any & all individuals until they have received proper safety training . Carpenters precede the Millwrights in an attempt to make the work area safe , covering up obvious fall hazards with plywood . Millwrights will then add lighting and air movers (fans) in an effort to make their 'home sweet home' as hospitable as possible , since they will be spending sun-up to sun-down here , six and sometimes seven days a week until the project is completed . It's 'work/eat/sleep/travel' with long hours in dark , hot and impossibly cramped spaces simply as a way of life . 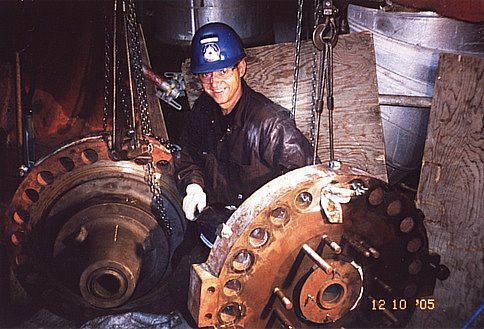 Judging by the smile on this Millwrights face , however , I would have to guess we are looking at none other than a very seasoned professional . Gary Desi and his very capable partner Dawn Hannah doing valve stem inspections utilizing precision instruments calibrated to within one/ten-thousands of an inch . Typical of the 'many-hats' kind of work Millwrights enjoy . 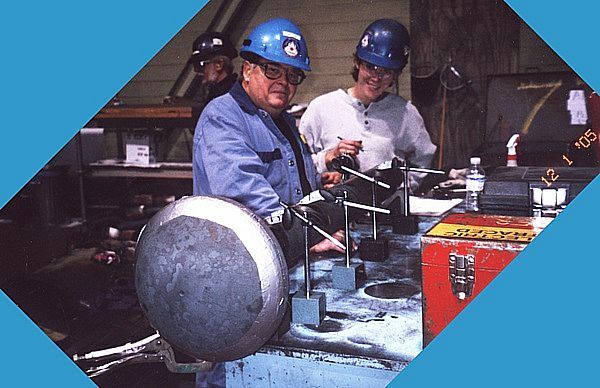 The next day saw Gary & Dawn assigned a difficult 'tear out' procedure involving the overhead crane , hammer wrenches , and dozens of steps & considerations that resulted in the safe landing of a large valve body onto the Turbine Floor for disassembly and inspection . Good job guys ! 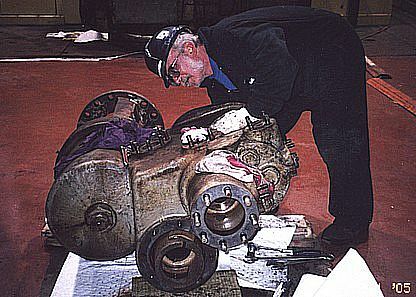 Ray Sibbett has been handed another valve body for disassembly right down to the bare casting . 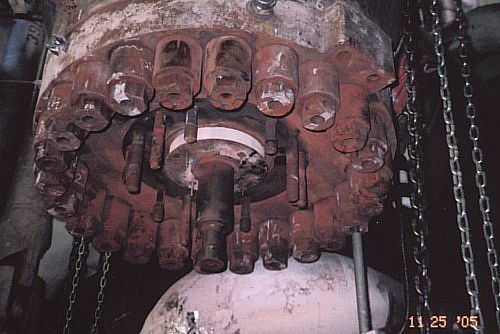 Many moving parts to these high pressure steam regulating devices , and because of the incredibly demanding environment each valve body must endure , the periodic inspection timetable requires exacting feedback in order to ensure trouble-free operation until the next down-turn . 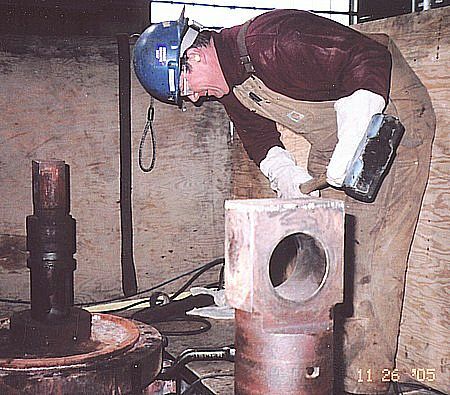 These types of inspections require much more than just numbered results , but also a 'feel' for the total integrity of the whole unit , from casting condition , polished shaft's coloration and even bolt torques on disassembly . Nothing that might indicate what kind of life this component has lived is permitted to escape the watchfully eyes and hands of the Pro . Above we see George Wicks shooting me a look after I comment that I can never seem to find him working . Randy get's the joke and laughs out loud . 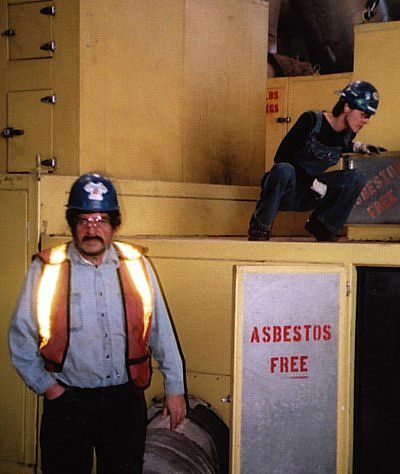 The entire crew knows however , that George is an indispensable member of this team who rarely leaves his post , situated a level or two below the Turbine floor . 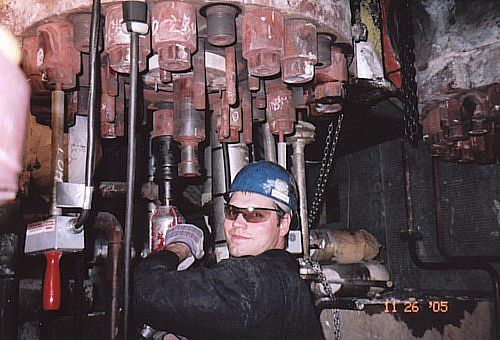 He is one of the Millwrights assigned to the difficult and thankless task of overhead , extremely corroded R.E.S.V stud removal and just happens to be very good at it , as his supervisors are well aware . Hey buddy , I was just kidding (as if he didn't know) ! Brian Grant swings a 'Persuader' . The process of removing these huge bolts demand that Millwrights go into attack mode . The level of concentration is practically 'mind over matter' . This is as demanding as it get's , and it's the kind of work that only very skilled mechanical trades are able to accomplish within the allotted time frame . 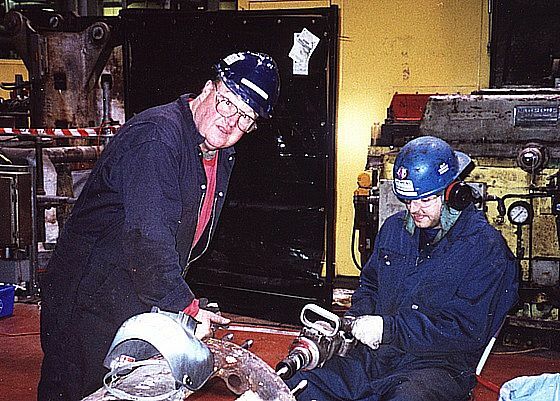 Millwrights have a saying "when it's too tough for anyone else , it's just right for us" . Ed Hanson and Trevor Vormitag remove several dozen smaller diameter studs . Sometimes they come easy , sometimes hard and sometimes they 'snap right off' at the base in the process . Oh well , one way or another they will be removed and replaced as Ed and Trev' routinely proved . However , something was learned in the process and will be stored in the databanks and reapplied somewhere down the line . Such is the duty of the Tradesman ... improvise , improve , then carry knowledge gained, forward to reuse and share . 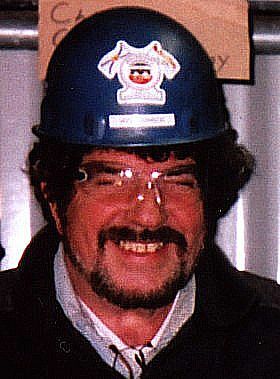 The Siemens's tool crib operator was captured here in a very rare photo (he absolutely 'hates' cameras) . Tool crib attending can be demanding at times and requires an individual with excellent people skills , a trait our attendant obviously possesses ... in spades !